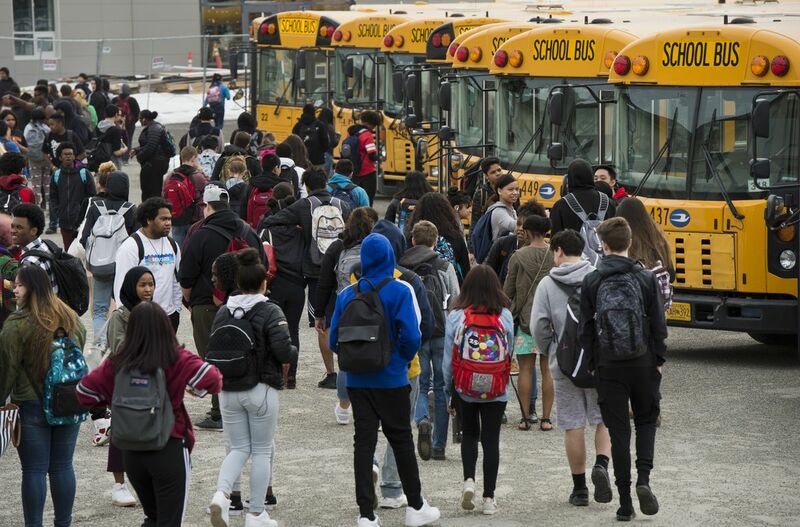 Anchorage School District Superintendent Deena Bishop wants high school and middle school students to start classes later and elementary school students to begin their days earlier. Under her recommendation, presented to the Anchorage School Board at a work session on Monday, no Anchorage public school student would have class before 8 a.m.
Bishop's recommendation follows about a year of board discussion, community surveys and a consultant-led study of the start time issue. The district's consultant had previously proposed several ways to shift Anchorage school schedules so older students' classes started later. Bishop has now narrowed the possibilities to one. The option she recommended didn't come directly from the consultant, but was brought up by School Board president Starr Marsett at a meeting in early June. While some board members said Monday they either didn't like the recommendation or had yet to decide if they approved of it, the board agreed to follow the plan sketched out by Bishop during the meeting. The district will hold three community meetings in September about the recommended schedule change and then vote on it in October. If the school board does vote to approve Bishop's recommendation, the new start times would begin in the 2019-20 school year. The board could also decide to alter the recommendation or, if the board doesn't approve it, school start times would remain unchanged. Here's what Bishop recommends: High schools start and end 30 minutes later, with classes from 8 a.m. to 2:30 p.m. Elementary school schedules shift 15 minutes earlier, with classes from 8:45 a.m. to 3:15 p.m. Middle school schedules move one hour and 15 minutes later, with classes from 9:30 a.m. to 4 p.m.
"It isn't the full-scale solution, but it is something that meets elementary and secondary needs of ASD kids," Bishop told the board. Bishop said under her recommendation, older students would get the benefits of starting school later than they do now, and high school students would still finish their days first, so they could take care of younger siblings after school. However, Bishop said, her recommendation does not move high school start times to 8:30 a.m. or later, as recommended by some national organizations, including the American Academy of Sleep Medicine and the American Academy of Pediatrics. "We're helping them a little bit," Bishop said of high school students. "We're moving toward positivity." Bishop said the district must have different start times for elementary, middle and high schools unless it wants to spend millions of dollars more on busing students. School board member Alisha Hilde said during Monday's meeting that she'd rather the district shift high school start times later than 8 a.m.
"I want to capture the research benefits," she told the board. "I don't see the benefit of asking this of our entire community unless we're going to, you know, go big or go home. If we know we can get good results, then I would like to not tiptoe into this." What do you think about changing school start times? Reporter Tegan Hanlon is interested to hear from Anchorage students, parents, teachers and other community members about the impacts of shifting school schedules. Contact her at thanlon@adn.com or 907-257-4589.